Holiday time is right around the corner! Did you finish decorating yet? Or did you even start?! Either way, make sure you’re ready to pack away all those small, delicate, and easy-to-tangle decorations back away into storage when it’s finally time to take down that tree. We know it can be a bit of a hassle, so we put together a few handy tips and suggestions to make the job as easy as possible. So before we get started, here are a few things to have close by, just in case! Your current ornament situation may be a little grim, but don’t fret just yet! Go through what you currently have and organize them by size, shape, and how delicate they are. The more delicate the ornament, the more careful you’ll have to be when packing it away. Wrap it in some tissue paper and use a rubber band to hold that there. We also recommend wrapping it in a second layer of some bubble wrap to really make sure it’s nice and safe in any container you put it in. After you’re all finished with sorting and you’re ready to store them away, add a few layers of packing peanuts (or even more bubble wrap if you still have some left) to give them some extra cushion. Some people prefer to purchase boxes specifically made for ornaments, with corrugated cardboard holders for each individual piece. The choice is yours to make! As a side note, some ornament sets are considered to be collectibles and usually come with a designated special container to keep them safe. It highly recommended to keep this box to keep the precious ornaments safe – and as a bonus, if they really are collectibles, keeping the ornaments in mint condition and having the box may make them a valuable asset if you ever plan on selling them. Just make sure you know what you’re holding on to and that you’re not just tossing away something important, it can make a difference! So you have most of your decorations packed now – great! The smartest thing to do from here is to clearly mark each container so you know what’s actually in each one. You might be thinking, “Why would I want to do even more work…? I just spent so much time organizing all of this!” And you’re right! It definitely takes a long time to get through this kind of task, but if you take the extra few minutes to mark each box and organize even further, you’ll save yourself so much time and stress in the future. You won’t ever have to deal with the struggle of trying to find one specific ornament that could be hidden in any of your many boxes again, or worry about not knowing which box has your wreath and which box has your lights! A wreath can really be such a nice addition to any holiday set-up, but they’re delicate and need to be handled with care. Packing them away can be a little bit of work because you obviously don’t want to do anything that’s going to mess them up at all. Have you considered purchasing a wreath container? These handy storage devices can really help preserve your beautiful wreaths and give you some peace of mind when packing away all of your decorations, knowing that nothing is going to get damaged in the process! Packing Up Your Ornaments for a Move? This helpful guide on how to pack ornaments comes in handy more than just during the holidays! If you’re planning on moving to a new home, this is sure to keep your holiday decorations safe until they reach their destination. If you are planning on moving any time soon, we are happy to help! Contact us online or call us today at (520) 822-6140 for a FREE quote! 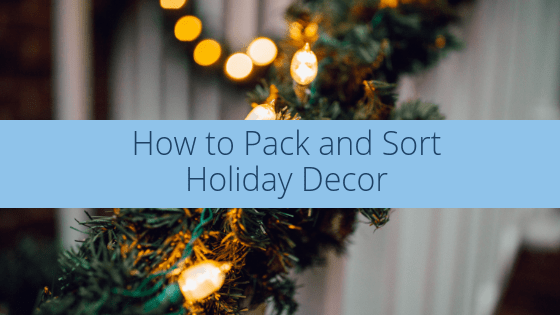 How to Pack and Sort Holiday Decor Overall rating: 5 out of 5 based on 14 reviews.